We had a another great Halloween night here at Lakewood. Sweet kids, polite teenagers and happy parents! I think we had about 80. A light year for us. We made and ate mummy dogs for dinner! Fun, cute and super easy. 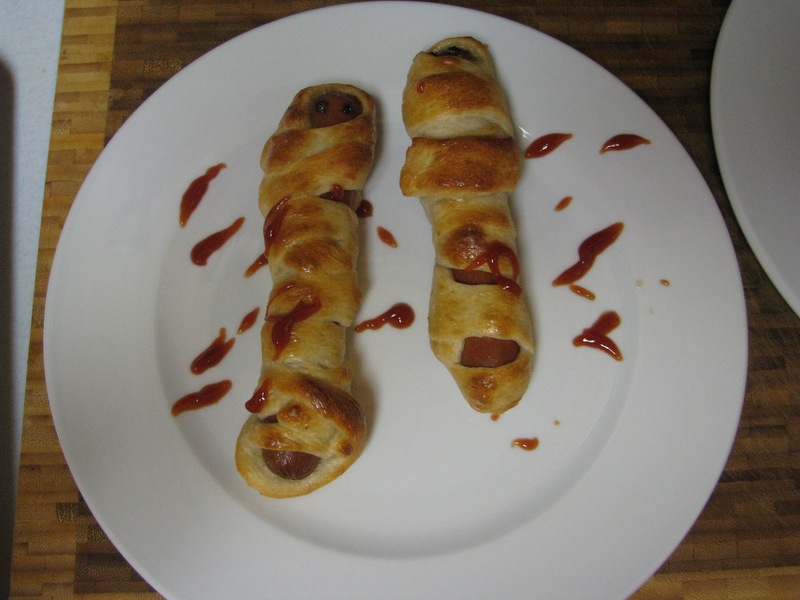 Bob wrapped hot dogs in slices of pizza dough. We brushed the dough with beaten egg and baked in a 400 degree in oven for about 12 minutes. Yummy! The dogs had to be put in their carrier, though. They had a hard time adjusting to the doorbell ringing so often. They looked so cute in their Halloween scarves! Your canine babies are too cute! What a great way to keep the kids safe and have fun at the same time. Mummy dogs, eh? Must remember that one. Mummy dogs! How cute! I bought my usual 400 treats but we ran out by 7:40 this year! I love the mummy dogs! That's one we'll have to try for the churches Halloween get together next year! The pups look sweet, hope they got a tiny tiny tast of a mummy dog. Don't want them being accused of cannibalism, do we? Sorry I've been away so long hope that you are well and taking care of yourself! Halloween is one time of year I wish we didn't live on a private lane. I would love to have kids come and trick or treat! !